I will not be blogging about our family, or our homestead, or animals, or baking or homeschool, or anything else that I used to- with the exception of quilts. 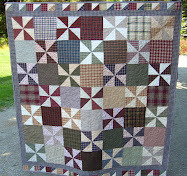 I'm taking this blog back to where it started....the love of quilting. I'll be sharing, as time allows, about completed quilts. And that's pretty much it. So if you love quilting, or quilts and you don't mind hanging around as I sporadically share quilts as they are finished, then I welcome you. I'm sure this will take on it's usual seasonal character, while I quilt more in the winter while it's cold outside and we are inside. As spring time arrives with planting and spring turns to summer with most days spent outside, quilting will take a back seat and the posts will be few and far between, if any. I made this quilt for our youngest boy who, I'm embarrassed to say, only had 1 quilt to his name, that was his baby quilt. He is 3 now and has outgrown that quilt's size....about a year ago. He was borrowing his big brother's quilt until his was done. Now he has this on his toddler bed and is warm under his very own big boy quilt. I used the Happy Trails Collection from Benartex fabrics, with the exception of the white stars on red print that was from the Rosie the Quilter line from Bayside Quilting. I wanted to add a little more red into the quilt and also wanted a fabric that kept the theme. Here is the backing fabric and a good chance to see the quilting on it. Unless you're able to see the quilt in person, the quilting disappears in the front of the quilt. The backing fabric is a flannel. Flannel is a must as far as I'm concerned for toddler bed quilts. Usually my kids don't have a sheet at this point, until they move to a twin size bed, and the flannel keeps them warmer than a cotton would. I'm working on a few more quilts right now so hopefully you'll see me back here soon!